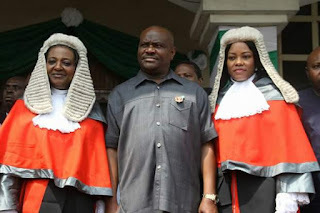 Rivers State Governor, Nyesom Ezenwo Wike has declared that his administration will continue to uphold the rule of law in the appointment of Acting Chief Judge of the State, noting that the state judiciary will never be dragged into unnecessary crisis under his leadership. Speaking during the special valedictory court session for the retiring Rivers State Chief Judge, Justice Daisy Wotube Okocha in Port Harcourt on Thursday, Governor Wike said that succession in the Rivers State Judiciary will only follow due process. He said that those who expected him to go the way of the immediate past governor who destroyed the judiciary for personal reasons, were disappointed as he remained steadfast in upholding the law. According to him: “Never again will the state courts be closed as a result of avoidable crisis of succession. Like I pledged, I will always respect due process in the appointment of the Acting Chief Judge”. Governor Wike commended the retiring Rivers State Chief Judge for her uprightness, saying that Justice Daisy Wotube Okocha has uplifted the State Judiciary in her short stay in office. While praying God to continue to bless her in her future endeavours, Governor Wike said:”her elevation as the first Chief Judge of the State process that nobody can play God”. In his remarks, Rivers State Attorney General, Emmanuel Aguma, SAN, said that the emergence of Justice Daisy Wotube Okocha as the Chief Judge of the State is a victory for the rule of law. Speaking on behalf of the Body of Senior Advocates of Nigeria in Rivers State, Chief Moses Wifa, SAN, praised Justice Daisy Wotube Okocha for her exemplary conduct on the bench. Also speaking, Chairman of the Nigerian Bar Association, Port Harcourt Branch, Mr Denis Okwakpam said that the retiring Chief Judge was an impartial arbiter who always upheld the constitution. Acting President of the Rivers State Customary Court of Appeal, Justice Christy Gabriel-Nwankwo said that members of the bench would continue to count on the advice of Justice Okocha. Responding, retiring Rivers State Chief Judge, Justice Daisy Wotube Okocha commended Governor Nyesom Ezenwo Wike for his respect for the constitution. She said that in her short stay in office, she was able to improve the State Judiciary. Earlier, Governor Wike attended a valedictory church service held in honour of the retiring Rivers State Chief Judge at Saint Paul’s Anglican Church, Port Harcourt on Thursday.